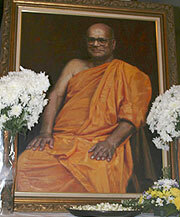 Kuala Lumpur, Malaysia -- Due to popular demand, the Buddhist Channel have compiled all the resources produced by various parties and individuals during the late Chief Venerable's funeral from August 31 - September 3, 2006. The Buddhist Channel feels blessed to have been able to cover the event "live" via the Internet. Through active collaborations with renowned bloggers like Jeff Ooi and Oon Yeoh, we have been able to demonstrate the power of "New Media" as a viable media platform. An example would be the online tribute facility, which gave the opportunity to those who were not able to attend the funeral to pay their tribute to revered venerable. We would like to thank all parties concerned for their kind contribution. 40 foot pyre for the "Chief"